Pack your duffel and head for the weekend! Perfect unisex duffle in bold shades of navy and gray. 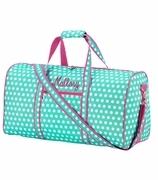 This duffel offers ample space to carry all you need in a neat and organized fashion. Use the carry handles on top to grab-and-go or the removable over the shoulder strap for a hands-free look. The eye-catching stripes are on-trend and super cool. Pair with a matching backpack WB-M362GRY or lunch bag item WB-M382GRY from the same collection if you need extra storage space for a longer trip. Decorate the duffel and backpack with initials, name or single letter. Wow the favorite person in your life with this fashionable and thoughtful gift.